Definition at line 609 of file lloctree.h. Reimplemented from LLOctreeState< T >. Definition at line 612 of file lloctree.h. Definition at line 613 of file lloctree.h. Definition at line 615 of file lloctree.h. Definition at line 620 of file lloctree.h. 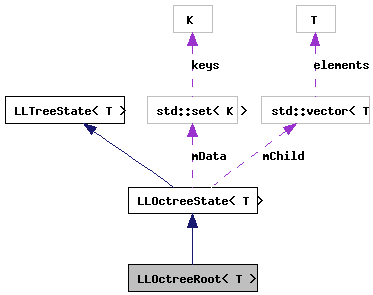 References LLOctreeState< T >::addChild(), LLOctreeState< T >::clearChildren(), LLOctreeRoot< T >::getOctNode(), i, LLOctreeState< T >::mChild, LLOctreeNode< T >::setCenter(), LLOctreeNode< T >::setSize(), TRUE, and LLOctreeNode< T >::updateMinMax(). Definition at line 617 of file lloctree.h. Definition at line 655 of file lloctree.h. References LLOctreeState< T >::addChild(), LLOctreeState< T >::clearChildren(), LLOctreeNode< T >::getCenter(), LLOctreeState< T >::getChildCount(), LLOctreeRoot< T >::getOctNode(), LLOctreeNode< T >::getSize(), i, LLTreeNode< T >::insert(), LLOctreeState< T >::insert(), LLOctreeNode< T >::isInside(), llendl, LLVector3d::mdV, NULL, OCT_ERRS, LLOctreeNode< T >::pushCenter(), LLOctreeNode< T >::setCenter(), LLOctreeNode< T >::setSize(), size, and LLOctreeNode< T >::updateMinMax(). Definition at line 618 of file lloctree.h.